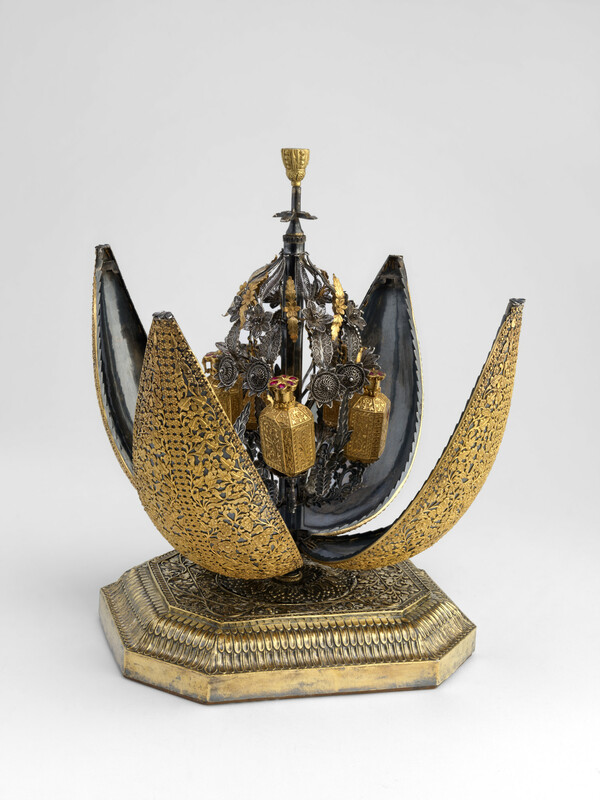 A silver and gold perfume holder or attardan in the form of a lotus bud. The four 'petals', decorated with an elaborate gold openwork floral pattern, open when the finial is pressed. Contained in the bud are eight gold scent bottles chased with floral designs and set with rubies. The scent bottles are attached to silver filigree brackets which spring from a central stem and are separated from each other by sprays of filigree flowers. The bud stands on a broad octagonal base, chased with a floral design with fluted moulding around edge. Perfume was offered within the Indian court to welcome visitors. Components of this holder are likely to have been made in different workshops or possibly parts of India. The gold openwork and base are similar in style to metalwork produced in 19th century Madras (modern-day Chennai) and the silver filigree brackets are similar to 19th century metalwork produced in Orissa (modern-day Odisha).